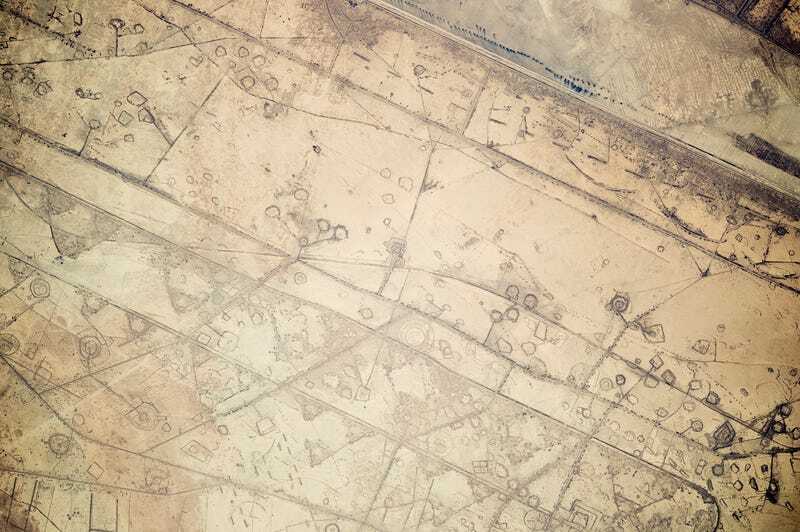 This image, taken by Expedition 41 aboard the International Space Station, looks like the fine artwork of some extra-terrestrial, but it's actually decades old scarred earth and entrenchments of warfare along the Iraq/Iran border. Systems of large curved earthworks, circular gun emplacements, and straight connecting roads run parallel to the international border. First thought by the ISS team to be oil-pad installations, the strategic location of these formations along the international boundary made it easier to see these as patterns of military fortifications. This region of oil refining and exporting was the center of numerous military actions during the war in the 1980s, especially during the defense of the southern city of Basra.